This section is only for users without an existing STUPS infrastructure! However, you can try out Senza deployments with a publicly available Taupage AMI. This page will explain how to try out Senza with a default AWS VPC setup and the public Taupage AMI. a SSL server certificate for your domain (e.g. “*.stups.example.org”) uploaded to IAM and named after your domain (dots replaced with hyphens, i.e. “stups-example-org”). A self-signed certificate will also do for testing. First install Python 3.4 on your PC (Ubuntu 14.04 already has it installed, use Homebrew on Mac). We will assume you have the AWS credentials and region (we use “us-east-1” in this example) correctly set for the remainder of this section. The public Taupage AMI (named “Taupage-Public-AMI-*”) used in this section is currently only available in US East (N. Virginia) and EU (Ireland), i.e. other regions will not work (however, you can create your own private Taupage AMI anywhere). The senza list command should print an empty table (just column headers) as we haven’t deployed any Cloud Formation stack yet. A Senza definition is essentially a Cloud Formation template as YAML with support for custom Senza components. Senza init will ask you a bunch of question, for our “Hello World” example, you only have to choose the “webapp” template and confirm the default answers with “RETURN”. The selected “webapp” template already takes care of creating the necessary security groups (“app-hello-world*”) and IAM role (“app-hello-world”). 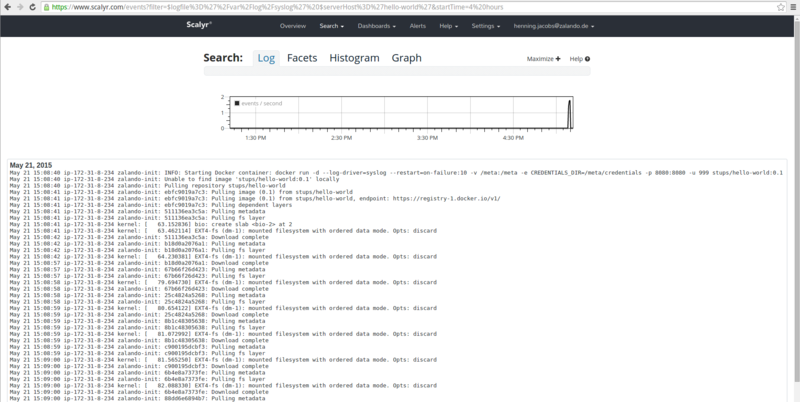 The Taupage AMI supports logentries and Scalyr as logging providers. By using the Docker image version tag “0.1”, we tell Senza to deploy the Docker image “stups/hello-world:0.1” from public Docker Hub.